With the last debacle in my rear view mirror, I am looking into some further options to get myself into a Saab 9-2x Aero. Since I am already flying into San Francisco on Friday and now renting a mini van from Alamo one way to LA, I have some time to kick tires and look at cars. Unfortunately I have turned to Craigslist for this adventure but at least I found something that may be of value. The highlights on this one include that it has 130k miles, Timing belt + water pump + head gaskets were done at 98k miles (along with the brakes, so all of the maintenance required on the other one), and it appears to be a clean and well running car. No rust reported, but who knows what could come up in an inspection with this being an East Coast car originally. Its also silver and I HATE silver and its an ‘05 so 2.0L. But overall, its something worth checking out. So I am coordinating with the seller to look on Friday. Probably the only real concern I have are the mods and passing smog certification. This one is reported to be tuned with a “Cobb EBCS 3-port”, Cobb stage 2 with turbo back exhaust, lightweight crank pulley, and a Cobb cold air box. If I can get the seller to make it pass Smog, I would be happy with the mods if done properly. Either way, I at least want to test drive it whether or not I actually want to buy it. The purchase stage is now being held off no matter what until I move into LA after the drive across. 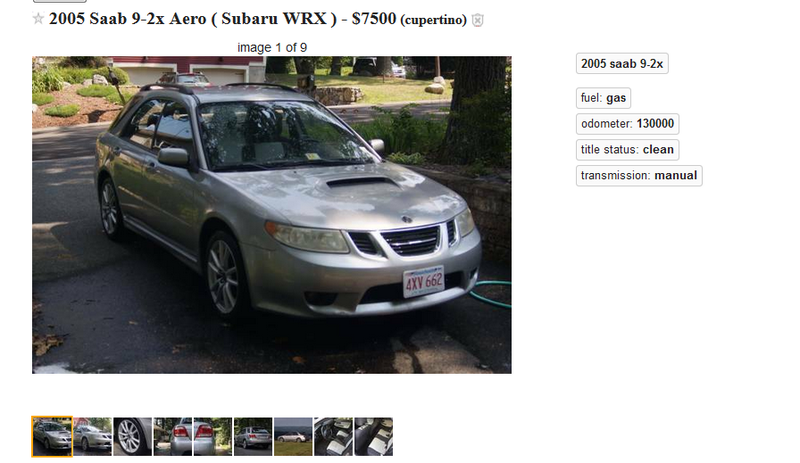 Its at least a good idea to check out a Saabaru and see if its really for me.